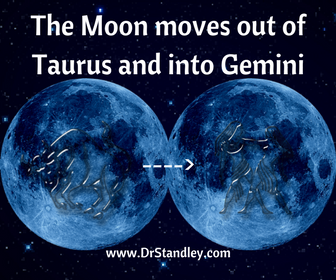 Moon in Taurus moves into Gemini at 12:58 PM EDT until Wednesday, July 11, 2018 at 1:59 PM EDT. 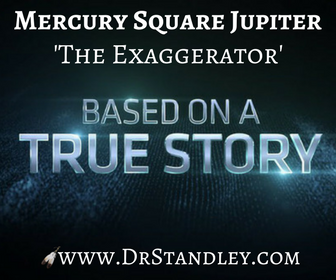 The BIG NEWS today is Mercury squares Jupiter, which is the placement of 'the exaggerator'. Remember, Jupiter will E-X-P-A-N-D whatever it touches, so it is expanding communication and all things Mercury related. This expansion comes in the way of a square, which is a challenge similiar to an elbow in your side. Good luck finding out the Truth under this aspect, which began in applying degrees on July 3rd, it is exact today, and it will last in separating degrees until July 18th. Interestingly enough, Mercury and Jupiter are naturally opposing planets because Mercury naturally rules Gemini (the 3rd house) and Jupiter naturally rules Sagittarius (the 9th house). Gemini and Sagittarius are opposing signs, as do the 3rd and 9th houses. So not only do these two planets represent a natural opposition, they are squaring each other at a very sharp right 90 degree angle. Both Mercury and Jupiter rule the two signs of communication, talking, speaking, writing, publishing, traveling, transportation, learning and educating. These two planets also rule these subjects at different levels of communication, learning, expression and moving about the locale, country or world. Now remember that Jupiter will E-X-P-A-N-D whatever it touches and when it expands Mercury, then this results in grandiose and exaggerated thinking. This is the classic placement for grandiose thinking that is just too 'out there' for realization. There is a rush to action in an attempt to get projects accomplished that are just too far out of reach for your circumstances, talents, skills, capacity or time that is required. This is just flat out unrealistic optimism. There are a lot of ideas being thrown around, plans being made, schedules laid out and bags being packed but none of it really goes anywhere. There are just so many options that you may not be sure which way to go or which plan (path) to follow. It all sounds so optimistic, wonderful and highly inflated and IT IS! Promises will not be kept and this energy bites off more than it can chew. Unless you tap Saturn for some self-discipline and sober-thinking, then you can expect a lot of talk and no action. It's just flat out 'lip service' from these two communicative planets (Mercury and Jupiter) out-talking each other. Often there is discrepancy between your beliefs and the actual truth. This aspect also cannot keep a secret. Somehow, someway, that secret information just comes blabbering out of the mouth. The minute someone says, "Don't tell anyone I told you but . . ." then that is the tell-tale sign not to trust that person because they will tell your secrets too. This aspect blabs secrets. Even if they don't mean to, somehow, someway, they will divulge that secret confidential information and end up saying, "I didn't mean to, it just came out." This aspect is a salesperson's easy prey because this placement will fall for all kinds of deals, MLM (multi-level marketing) or get rich quick schemes. In sales this person is called "a lay down" because they walk in with a couch on their back and they are an easy sell. This placement also causes one to have an intellectually inflated ego. This is mental pride. There is excessive talking and bragging in a bombastic way with the intention of impressing others. The bombastic ways are inflated without any meaning. In other words, it's a lot of hot air. 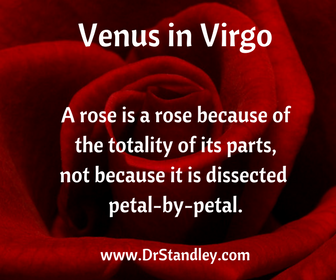 Also today, Venus moves into Virgo at 10:32 PM EDT. This placement brings about an over-analysis of emotions and causes us to be critical of those we Love. It is the classic nag! It complains, nags and whines about Loved ones. If you find yourself doing this, then ask yourself, "Who do I think I am?" When this card is played inappropriately then it can cause us to make others feel inhibited and self-conscious, which in turn closes down the spontaneous ebb and flow of communication. Talk about throwing a wrench in the cogwheels of Love! Remember, we are attracted to others because of the way they make us feel. If we are left to feel bad, then we are no longer attracted. Venus in Virgo is actually in its Fall. This is where you do not have all of the tools necessary to help you. This is like someone thrust into a management position 'without' the knowledge, experience or skills necessary to do the job. Or it's like the 6th grader entering college. 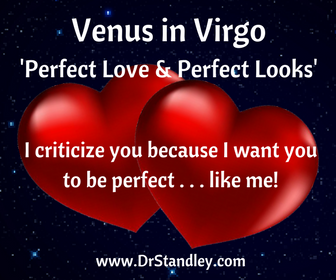 Click on either of the Venus in Virgo graphics to go to the Venus in Virgo monster-size write-up. 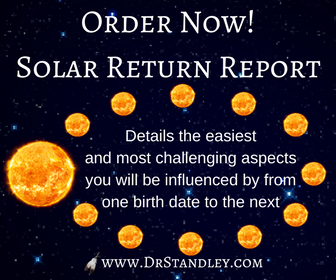 At the bottom of that page you will see links for your Monthly Horoscope for your Sun Sign. After I update your Monthly Horoscope I will post it on social media so you can go to your Monthly Horoscope page using the teal-colored-drop-down-menu above. I have another update to make in the Monthly Horoscopes as well since I was on vacation during that update. Watch for both updates later today. Download the 'Mercury Square Jupiter' chart wheel here! Download the 'Virgo in Virgo' chart wheel here! The Sun in Cancer trine Neptune in Pisces at exactly 10:42 AM EDT. This aspect began in applying degrees on July 3rd, it is exact today, and it will last in separating degrees until July 18th. The Moon in Taurus square Venus in Virgo at exactly 12:10 PM EDT. You will feel this energy within 12-14 hours 'before and after' it occurs. Venus moves into Virgo at exactly 10:32 PM EDT from July 9, 2018 until August 6, 2018.